Martin Luna, a new student at Bluford High, is at the center of this story. Haunted by the tragic death of his little brother, Martin seeks one thing: revenge. But his mother wants more for her only remaining child. Will Martin listen to her, or will he allow anger to control him? About Ben Alirez (Author) : Ben Alirez is a published author of young adult books. 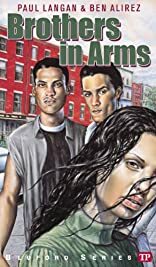 Published credits of Ben Alirez include Brothers in Arms (Bluford High Series #9).